A Cormorant fisherman floats his bamboo raft in the pouring rain on the Li River in Central China. Look closely and you'll see the raindrops moving through the air and catching the water in the light. Right now I'm sitting here with a fresh cup of coffee writing the descriptions on my 7 latest photo uploads. It's late autumn as I look our my living room window. The weather is cloudy and damp here in the Northwest. It's enjoyable. I really enjoy the entire process of photography, from planning the trips, to traveling and capturing the images, to coming home, editing the photos, uploading them and writing the descriptions after uploading. It's all fun creativity! Anyways, I don't upload photos as I take them, meaning You'll see images pop up that were taken 2 years ago, while others were taken last week. Pulling photos from all different trips keeps things interesting for me, and brings back great memories as well. This specific image comes from a rainy, damp and humid morning on the Li River near the small Xingping Fishing Village. Paul Weeks & I woke early at 5AM, and met the fisherman on the banks of the Li while it was still dark outside. The rain was coming down hard, the fisherman offered me a cigarette. Although I usually don't smoke, we were in the middle of nowhere, on the Li River, with an old fisherman, I accepted. As we smoked the fisherman pushed the boat into the Misty pre-dawn twilight and we made our way down the river. At this point I couldn't see 15 feet in front of me. Our fisherman / guide didn't speak any english, but did know how to Say "Hello". He liked to use this word for everything. HELLO! HELLO! HELLO! Eventually we pulled the boat off to the side of the shore. It was still dark out. He turned on the lantern, it was time to make photos! At this point knew I'd have to max out the D800 low light capabilities. 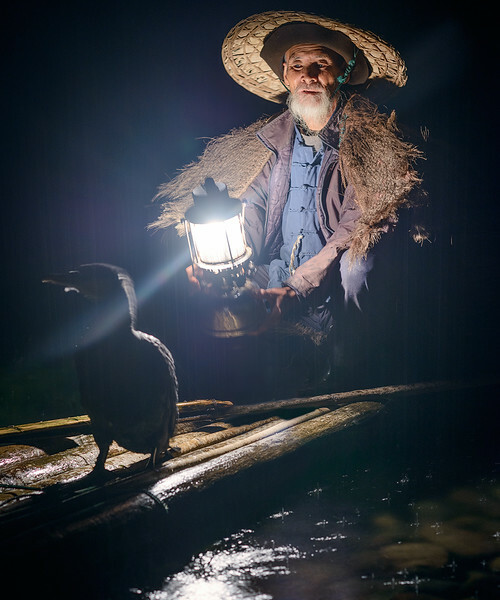 This image comes from a single RAW file exposed for the highlights of the lamp and focused on the fisherman's face. Since it was still dark out and the boat / fisherman were moving, I had to shoot at f/2.8 @ 14mm, exposure time of 1/20th of a second to capture the rain drops and freeze the frame. This required an ISO of 2000 in the pre-dawn light. The D800 is a beast. The fisherman's bird wouldn't stay still for anything but a fish. It continued to move around as seen in the front of the photo. I actually like the dynamic movement the bird gives to the scene. Provided below are a picture of myself with the fisherman and a video which I captured from the Li River.